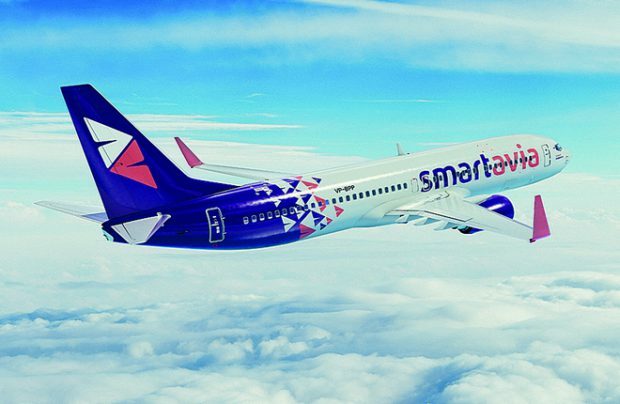 In a long awaited move, Russia’s privately owned Nordavia-Regional Airlines has officially launched its re-branded image, with the airline changing its name to Smartavia to emphasise its commitment to revolutionising its service through new technologies. The gradual rebranding process will occur throughout 2019, with the first aircraft sporting the airline’s new livery scheduled for early April, but the changes are not limited to a new name, a different livery and upgraded cabin crew uniforms. Smartavia is implementing new technologies to create “a conceptually new system of e-commerce,” insists Sergey Savostin, the airline’s general director. Among other things, the plan includes new passenger service standards, a new fares structure, a native website and a mobile app. The new brand will target “active people with a pronounced desire for self-development, and family audience,” he adds. Smartavia is positioning itself as an airline that is “comfortable to interact with smartphones,” says a statement. The re-branded carrier’s business model will retain that of Nordavia by remaining a “classic legacy airline” focusing on regular and charter services inside and outside Russia. Headquartered at Arkhangelsk in the northwest of Russia, the airline “respects the history and success of the original Nordavia,” but notes that its new ambitions are not reflected by the old name. Also, apart from Nordavia, there are two other airlines in Russia – Nordwind and Nordstar – whose names are directly associated with the north. Smartavia’s new colour scheme will be radically different from that of Nordavia, which resembled Aeroflot in a tribute to the times when the regional airline was a subsidiary called Aeroflot Nord. The aircraft fuselage will retain its basic silver background colour but with the addition of purple and coral. The creators of the new brand, DuckDesign, reveal that a pair of paper airplanes was chosen as the symbol of the airline, signifying the convenient turnaround of flights with people flying where they want to and then returning to where they belong. In addition, a compass arrow points at the company’s desire to serve its passengers’ needs. As well as the re-branding project, in the period from April to July of this year, Smartavia is to take delivery of six aircraft: five Boeing 737-800s and a single B737-700. These aircraft will all feature the new livery, and some of the existing fleet will also be repainted, Savostin says. As a result of fleet expansion, the company expects to almost double its traffic levels from last year’s 1.19 million to 2.2 million passengers in 2019. The airline is counting on strengthening its presence at St Petersburg and Moscow. It is currently coordinating its route network expansions with the main focus on providing direct services between Russian cities, particularly in the northern region with destinations in the south of the country. Passengers will be offered more connection options, it says. Nordavia Airlines currently operates a fleet of 11 Boeing 737s from its base airports at Arkhangelsk, St Petersburg and Moscow to more than 50 destinations in Russia and beyond. Meanwhile, the prospect of the privately owned Nordavia merging with state-controlled Red Wings Airlines, an initiative announced in 2017, is no longer on the agenda, Evgeny Klyucharev, Red Wings’ general director has confirmed. However, the two carriers will continue with their ‘alliance’ cooperation. “Shareholders from both sides realise that consolidation is vital, particularly in the current market environment. So our airlines will continue working in an alliance,” adds Klyucharev, who attended the partner airline’s re-branding ceremony. INSIGHT: Russian air transport on a flight path to stability?